How Long Do Parrots and Other Pet Birds Live? 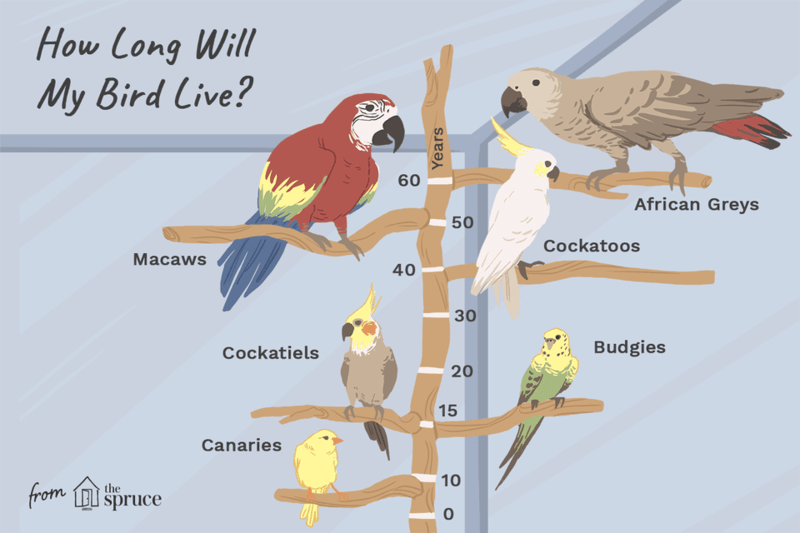 How Long Do Parrots and Other Birds Live? Parrots comprise a group of birds that includes 279 different species. They vary in size from small birds that can fit in the palm of your hand to large birds the size of a cat and their lifespans are just as variable. Pet birds can live for quite a long time. Potential owners need to be aware of the longevity of their bird so they can be prepared to provide proper care for them for as long as they live. Parrots are special among pet birds because many species have the potential to be with you for your entire life. They also often outlive their owners. Parrots usually live longer in captivity than in the wild because they are less likely to encounter predators and disease while living in a home. That, however, doesn't mean they are exempt from illness and shortened lifespans. As a general rule, the larger the bird, the longer the expected lifespan is. Listed below are some estimated lifespans for common parrots and other pet birds. These are, of course, based on a healthy bird kept under ideal conditions. In reality, there is a wide range in the age that pet birds might reach and certainly, some will live longer (or shorter amounts of time) than the ages listed. The most common factors that affect a parrot's life are nutrition, veterinary care, and mental health. Your parrot will thrive if you provide them with a secure and clean enclosure with plenty of space to climb and spread their wings. They should also get lots of natural sunlight or full spectrum lighting (rather than artificial light alone) as it will allow them to better process nutrients and establish an appropriate day/night cycle for their mental well being. Some birds should also be housed with other birds since they are a flock species. Humans cannot take the place of another bird, no matter how hard we try. If you are purchasing a pet bird, make sure to choose one from a trustworthy breeder. They should be able to provide you with health information on the bird's parents since genetics are also a factor in longevity. Giving your parrot an appropriate diet will also help keep it healthy and prevent disease. A well-rounded diet includes pellets, grains, seeds, nuts, and fresh fruits and vegetables. A balance of vitamins, protein, fats, and minerals (such as calcium from sources like boiled eggshells) is critical in maintaining a bird's health and longevity. Giving a bird a diet that consists mainly of sunflower seeds (which birds love) is one of the worst things you can do. These contain high levels of fat and very few nutrients. While many individual parrots have lived a considerably long time, a couple became very well-known for their extended years. Alex is probably the most famous parrot. He is known for his work on the avian language experiment (which is what his name stands for). He was purchased from a pet store by Dr. Pepperburg and lived to be 31 years old. A book was written about him and the research he took part in. It was thought that he had the emotional level of a 2-year-old when he died. Cookie the cockatoo was a Guinness World Record holder as the longest living parrot for a time. He died in 2016 at the age of 83 and lived almost his entire life at the Brookfield Zoo after having been shipped from an Australian zoo at about one year of age.